Patti LuPone's showstopping performance of Rose's Turn in Gypsy is one of the most memorable evenings I have had at a musical on Broadway; she was absolutely amazing. I like this New York Magazine photo diary of her Gypsy final performance day. While Women on the Verge of a Nervous Breakdown was a flop, I liked her quirky performance as Lucia. After reading her memoir, I understand why she took the role. She never turns them down!!! During Nervous Breakdown's run, Ms. LuPone took a break from the show and performed her own show at the Bergen Performing Arts Center in NJ; once I found out here the heck the center was, I crossed the river to get more of this Broadway diva. While it is unlikely that I will ever return to BerPac for any event, I was happy to listen to Ms. LuPone for the evening. As you can see, I am a fan of Ms. LuPone and had heard about her diva reputation but did not quite know how she acquired this reputation. 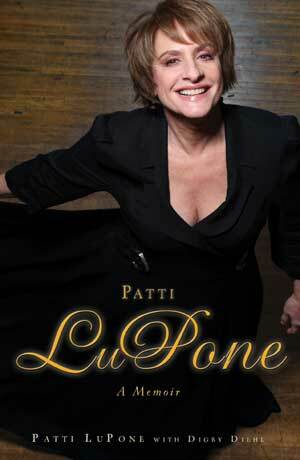 Therefore, reading her memoir aptly entitled Patti LuPone: A Memoir was enlightening. The most fascinating parts of the book are her encounters with Andrew Lloyd Webber during Evita (the show that launched her as a theater star) and later in Sunset Boulevard. Also, the lessons she learned during her lifetime career in the theater, the erratic nature of her relationship with Kevin Kline, her marriage finally at age 39 and having her first and only child at age 41 are interesting. I could probably go on for a week about Ms. LuPone's career. But today, I will run through a few lessons from her memoir and then tomorrow - Evita and Sunset Boulevard!! The less you care, the freer you are. ...when you swallow your pride, you often choke on it. Sticks and stones, sister. Here, have a Valium. There are moles in Broadway houses. No one knows who they are but things that only people working on the show would know get printed in the most vicious ways. Don't believe your own press. Somewhere, give it time, there's a banana peel with your name on it. ...nothing is impossible-that diligent work, patience, and trust are the only things that will see you through to the very end of any journey.